Pomp, panache and narrative puzzles waltz their way through Zhang’s martial-arts rhapsody, a luscious whirligig of horseplay and horseshit that pitches Chinese imperial history as cartoon romantic pageant. Anyone whose reality-bell rattled when the lover-fighters shimmied over lakes and bamboo leaves in Crouching Tiger, Hidden Dragon should walk on by now; here, to give but one example, we find Maggie Cheung serenely fencing off a hailstorm of arrows with her chiffon shirt sleeves. 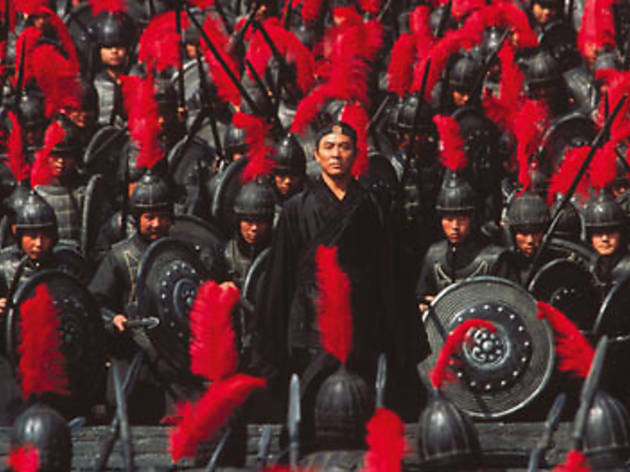 A cadre of Asia’s finest—Cheung, Tony Leung, Jet Li and Zhang Ziyi—submit themselves to Zhang’s paint-box prodigalities in a 'Scope-screen mock-up of third-century BC China, when the ruler of Qin sought to unify the seven warring kingdoms. 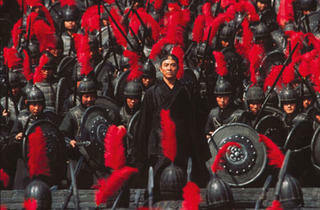 Before him comes an unsung, nameless warrior (Jet Li), who claims to have rid the king of his three flightiest enemies: Sky (Donnie Yen), Flying Snow (Cheung) and Broken Sword (Leung). He spins out the story of his success—how he played off the lovers Snow and Sword by stoking dormant jealousy—but when the tale is told the king smells a weasel and calls him on it. Cue a second spin on the story, then a third and a fourth. Zhang busies himself demarcating the rival flashbacks with screen-saturated colour-coding, painting the town first red, then white, pale blue and green: a triumph as absolute as the conquest sought by the king of Qin himself. The sumptuousness recalls Zhang’s radical early melodramas Red Sorghum and Ju Dou, not to mention his origins as a cinematographer, but he’s a very different director these days: Hero hangs its stylings on a proposition of national pacification-through-subjugation that would seem more gallingly fascist if it actually carried any weight. (Hero’s companion piece House of Flying Daggers, released in December, goes a slight way towards redressing the political balance.) More ticklingly, the film dishes up some of the most extravagant doodling in cinema.